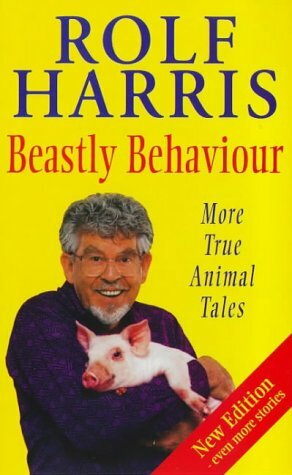 A further, fantastic collection of Rolf Harris' favourite true animal stories from around the world. This heartbreaking, inspiring and very funny sequel to the bestselling True Animal Tales contains even more stories than ever including. Its a funny book..with all kind of stories. Release planned for Saturday, April 10, 2004 at n/a in Mailed to fellow bookcrosser, Postal Release Controlled Releases. The Booklet - Biba89 krijgt deze! I have asked for this book, stories about animals will always interest me. I finished it this morning. Heartbreaking, indeed. There were many stories about people being rescued by dogs, cats, cows, a seagull even. About a house pig arresting a burglar by simply sitting on top of him until the arrival of the police. About animals getting lost and turning up three years later in a different part of the country or even the world. This is probably meant as a cheerful book, with all kinds of stories presented equally funny and endearing. Anyone reading this book could be surprised about how intelligent and sensitive animals can be, much more than we usually know. But there is another angle to view this book. Personally I am disappointed about the lack of critical view on some of the events described here. Pets treated and seen as little people with little or no view on the animal's natural behaviour. Numerous cats, dogs and even an iguana dressed up as little motorcyclists and perched on the steering wheel of a motorcycle. A chimpanzee, imprisoned in a New York apartment and addicted to alcohol. Numerous chimpanzees, dolphins and kangaroos posing as endearing creatures in numerous TV series, where they were treated with outright cruelty to make them do what is filmed as cute behaviour. What actually happened, is that for instance the chimps used for the Cheetah character in the Tarzan films were drugged and had their teeth knocked out. When they reached puberty, they were killed or sold to laboratories, only to be followed by the next miserable chimp baby to pose in the film. All this can be common knowledge for someone doing the thourough research as this Rolf Harris apparently did. I am not so convinced about his motivations as an animal lover. You only have to look closely at the picture on the cover, where Harris poses with a cheerful smile, a monkey perched on his shoulder. The animal looks very frightened indeed. This book can stay on the bookshelf of our institute, until anyone requests for it. Released on Sunday, November 14, 2004 at about 5:00:00 AM BX time (GMT-06:00) Central Time (US & Canada) at Controlled Release in Controlled Release, Controlled Release Controlled Releases. Beastly behaviour is being sent off to Carijn. Enjoy! Vanmorgen kreeg ik het boek toegestuurd door Biba 89.